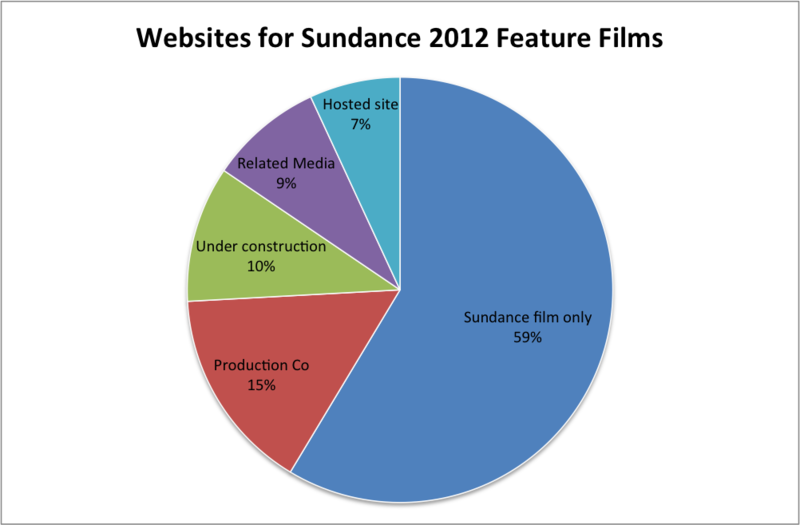 Sundance 2012 & Social Media: What’s a Filmmaker To Do? 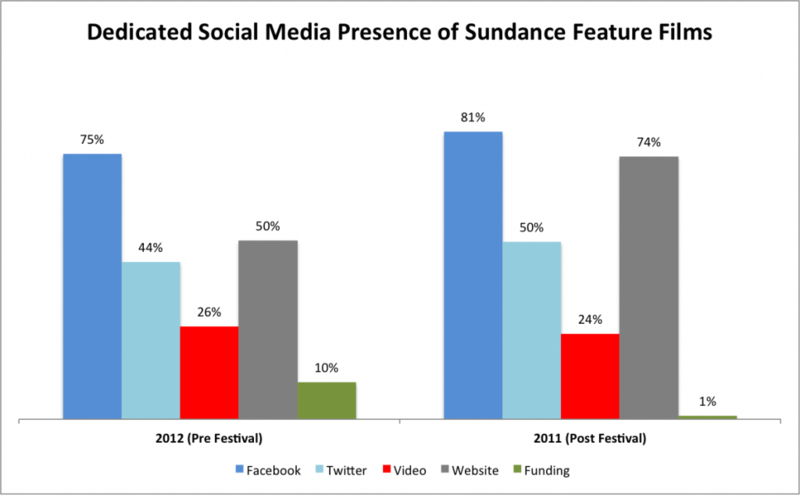 Last year, I took an in-depth look at how Sundance feature films used social media during the Festival, and if social media was a good predictor of a film’s critical or financial success. With 9 days and counting until the 2012 Festival kicks off, I thought I’d take a look to see how films might be using social media differently this year. After all, since last year’s Festival, Facebook gained 200 million new users, Twitter toppled a few dictators, folks are uploading a third more video content to YouTube every minute, and Kickstarter quadrupled the number of dollars pledged to new projects. Last year’s data was compiled about a month after the Festival concluded (and both graphs group YouTube & Vimeo into Video, and Kickstarter & Indigogo into Funding). Hopefully this graph suggests that there are still a large number of films that are scrambling to create, maintain, and master their own social media accounts, not that fewer films are using social media in 2012. In light of that, a few friendly tips about how independent films should think about using social media. The Music Never Stopped has [used to have] a “request this film in my city” section of their Facebook page. Even pages without this function at least know the geographic distribution of their fans based on Facebook Insights, and could use this data to plan screenings. YouTube/Vimeo are being best utilized by critics & fans to promote/curate lists of films they love/hate, and need access to embeddable video content from the films. Distributors with a strong social presence have the benefit of time to build a captive audience, but it’s unclear to me how well audiences travel between films (for example I’d be fascinated to see on the Fox Searchlight Facebook page if the folks who interacted with Black Swam content also interacted with Cedar Rapids content). I’ve also personally noticed the value in using these social media fans to promote the films once they gain wider release (see, Pariah), and clearly quite a few films are realizing the funding value of networks like Kickstarter and Indigogo (more on that below). Consider Facebook your long-term base of social media supporters and a good archive of all the content you’re posting online. Some films have already been accumulating fans for months or years — throughout the filming, post-production, and festival-submission process. Especially for those films making the indie film circuit, Facebook fans, and as importantly, their friends, can give you momentum as you travel from city to city. And the photo albums and links to press mentions can serve as a permanent content storage system. Even though you have less flexibility in the design and features of a Facebook Page compared to a website, it’s easier to maintain, can get across the same vital information to press, distributors, and the public, and will have far better SEO than your website (try finding the movie L in a google search). 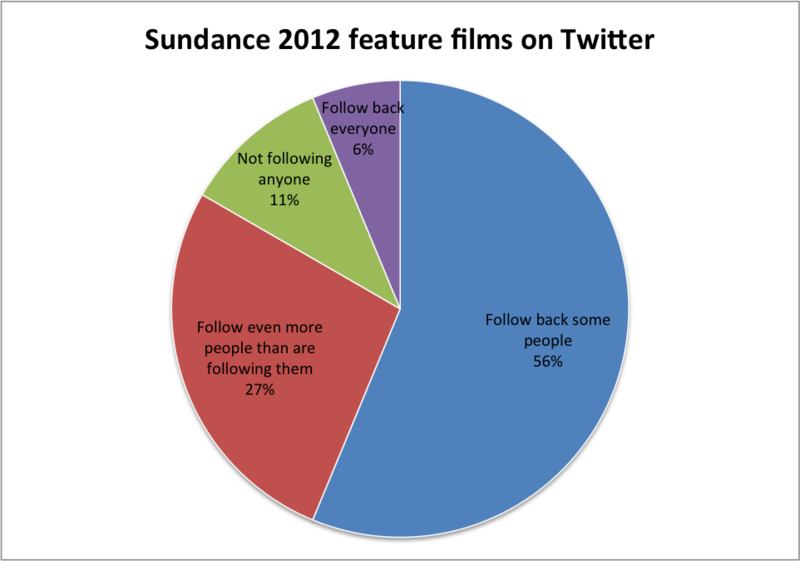 And on average, it’s likely that your Facebook Page will have more “likes” than your Twitter account will have followers, true for 79% of the 47 Sundance feature films this year with both networks. “Like” other Facebook Pages that you share a strong affiliation with — same production company, same actors, similar topics of interest, etc. Consider Facebook advertising. Just to start the ball rolling on getting people to the Page so it doesn’t sit lonely in the far dark corners of Facebook, I’d spend $50 to get 100 new “likes” from people who have an interest in “independent film” (over 2 million Facebook users in the US), in any of the other Festivals the film might be showing at (there’s about 500,000 Facebook users who have an interest in Sundance, Tribeca, LAFF, Telluride, Berlin IFF, or IFC), or based on a topical interest (Note to The D Word: looks like there’s at least 50,000 people with a demonstrated interest in Dyslexia). Consider adding a welcome tab to introduce new users to your Page. PageModo has a great free option, look to Excision, The Last Elvis, Big Boys Gone Bananas, or Tim and Eric’s Billion Dollar Movie for inspiration. Add a Twitter tab to showcase what’s happening on that network. Involver has a decent free app. Set your Facebook URL to the title of your film. Use that new URL on posters, postcards, business cards, etc. Add a Facebook icon (or other social plugin) to the footer of your website/blog and in your email signature. 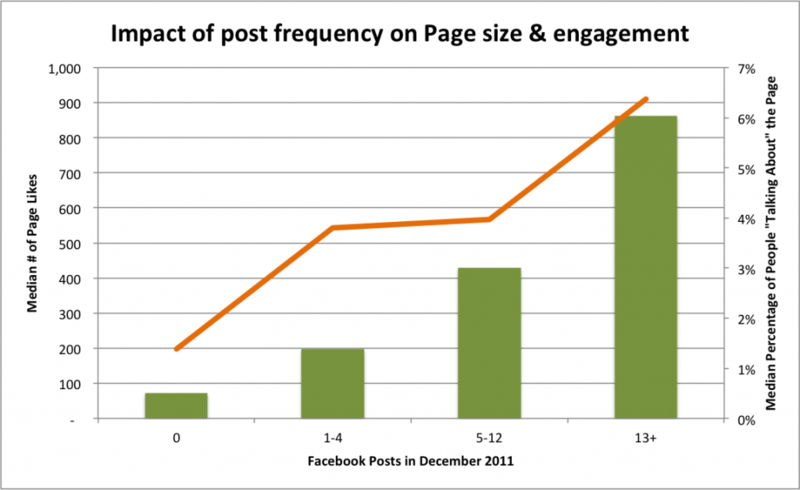 Get to know the Edgerank Algorithm that Facebook uses to decide which of your posts will appear in fans’ newsfeeds. That means going heavy on the photos & video, posting new content when fans are most likely to see it (not just when it’s most convenient for you — use Hootsuite’s message scheduler for scheduling), and asking friends & family to “like, share, comment” on new content in order to seed the affinity score. Start posting content on Facebook. I’d aim for at least every other day, at least in January. In December, the Facebook Pages of the Sundance feature films that posted at least every other day had 4x more fans, and a higher percentage of those fans were “talking about” the Page, compared to those films that only posted 1x per week. And remember come January 30, Facebook posting doesn’t stop just because the Festival is over. The few thousand people who have “liked” your Page will want more updates as they happen in the coming months, and as mentioned above, you can use what you know about these people to help plan future releases. Don’t forget to use Facebook Insights to better understand your audience — Facebook has a decent Guide to Insights [PDF]. Start a Twitter account. Have a username that’s short (10 characters or less is great, your max will be 15) but easy to read/remember. Make sure to include the full name of your film in your bio so people can search Twitter’s directory and still find you. Use the rest of your bio as a one-sentence pitch for the film and don’t forget a striking profile image that still looks good at 16 pixels. Consider a customized Twitter background. Look to That’s What She Said, Filly Brown, The D Word, or Wish You Were Here for inspiration. Download a mobile app to use Twitter on your device of choice — I like TweetDeck, some people swear by HootSuite, even Twitter’s own app is pretty good. Build a list of the other people who worked on the film that also use Twitter. Basil Tsiokos has a great example list of Sundance 2012 filmmakers. Retweet those folks when they tweet something interesting. Start tweeting: let the world know what films you’re watching/digging, keep an eye on @sundancefest for news about what’s happening with other films, hold a Twitter Q&A with the artists you didn’t have room to bring on stage for the post-premiere Q&A, if you check in on Foursquare to a film venue or a public party — send it to Twitter too, snap a photo of the massive line outside the Eccles waiting to see your film, start a hashtag trending just for fun (Jimmy Fall does this nicely each week) — something like #CollegeReunion for Liberal Arts, or #WhatIfRosieTheMaidReturned for Robot and Frank, and respond personally to all the regular folks raving about your film on Twitter — but don’t forget to look for both @mentions and people just using the title of your film (and for films with generic titles, include “Sundance” in the search to narrow results). Please don’t autopost from Facebook to Twitter. It’s sloppy, it’s essentially spam, and you’re almost guaranteed to not find a sizable number of followers. Use a (free!) tool like Crowdbooster to track how well your content is doing on Twitter. But unlike Facebook, I’d worry less about the analytics on Twitter and just tweet about what’s on your mind. Don’t worry about YouTube or Vimeo as a social network. Unless you’re posting new videos as part of a weekly series, all of my previous research suggests that you’re never going to collect enough subscribers to make a true network. Instead, think of it as a place to store video — like trailers, interviews, or rough cuts, which other people can embed on their blog, newspaper, website, etc. So…YouTube versus Vimeo? 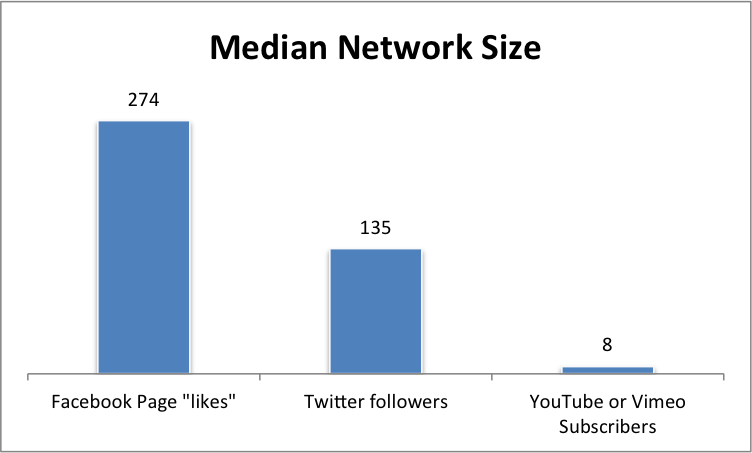 Slightly more of your peers chose YouTube (57%) as their network of choice. Vimeo has a better design aesthetic, more random people are likely to surf across your video on YouTube, but they both offer the same embedding tool. Just as a point of reference — your peers posted on average 2 new videos in December, and on average those videos had 3,220 views each (though that includes videos embedded on other websites that automatically begin playing when someone loads the page). 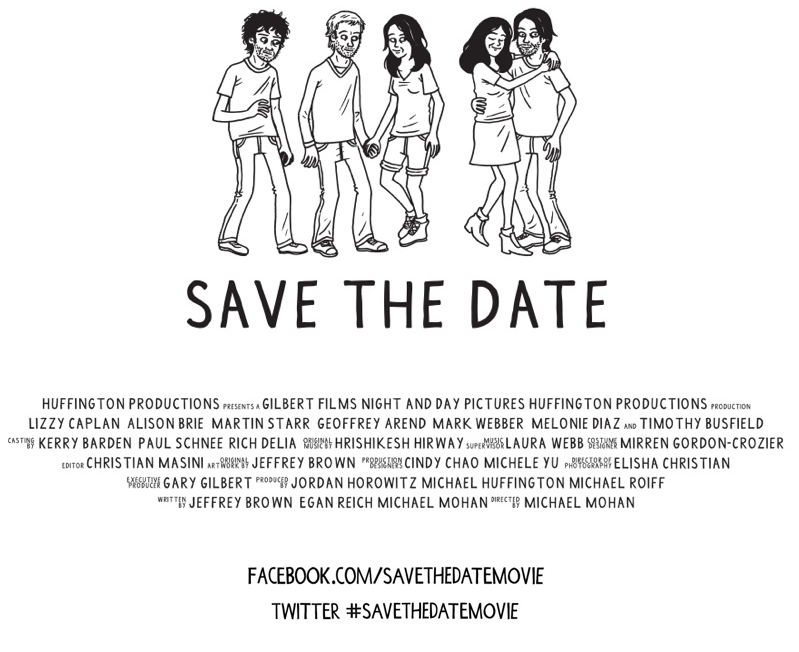 Have a URL to point people to on marketing materials → why not sure facebook.com/yourmovietitle? Feature content in ways that social media cannot → also probably true. A few of this year’s films’ website included features like merchandise shops, opportunities for the public to upload their own content to the site, and dedicated areas where only the press can download information. I was surprised not to find more Tumblr accounts, an experimental Google+ Page, and maybe a Pinterest snuck in there somewhere, although 1 film was pimping their MySpace page, and another filmmaker included a link to his LinkedIn profile in the film’s website’s footer, which might actually be kind of smart. 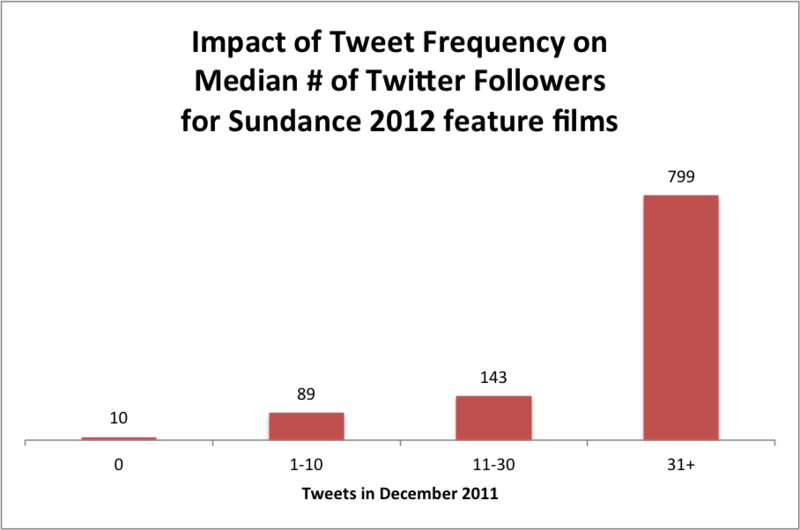 There’s a bit of social media on the Sundance website, but based on last year’s data I doubt there’s enough social interaction on the 2012 sundance.org to predict film awards or sales. In general, the number of tweets a Film has received from the Film Guide (9, below) is a decent predictor of how many Twitter followers they have, but the same is not true for Facebook, and there’s just not enough action on the +1 buttons for meaningful conclusions. That said, a lot could change in the next 9 days. I’ll try to capture another set of data just before the Festival opens, and another set post-Festival, and perhaps a few case studies for while the Festival is in action. Maybe someone will Storify the Festival? So what did I miss? What other questions or ideas do filmmakers/film marketers have for using social media to connect with audiences? What other data should I be looking at?